The Jakhoo temple of Shimla is the most famous temple dedicated to monkey god Lord Hanuman, It is situated on Jakhoo Hill, 2.5 km /1.3 miles east from the Ridge, Shimla at a height of 2,455 m (8,000 feet) above sea level. 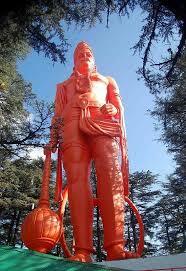 Jakhoo temple is an ancient temple in Shimla, dedicated to Hindu deity, Hanuman. Shimla's highest peak offers a panoramic view of the Shivalik Ranges and the town of Sanjauli. One legend goes that Lord Hanuman stopped there to rest while he was searching for the Sanjivni Booti to revive Lakshmana in the Epic Ramayana. On arrival at the temple signs advise visitors to secure all personal belongings and beware of the monkeys, which are everywhere. This is appropriate as the temple is in honour of the Monkey Lord. Visitors must remove shoes (and leave them in the "shoe house") before entering the temple. Over the years Jakhu has become one of the important part of Shimla town and autho- -rities have improved the conditions in past few years. Now this campus has enough space for families to have fun around the temple. There are some special arrangements for kids. Basically this temple is located on a hill called Jakhu and that's why the temple is also known as Jkhu temple. It's hardly 2 kilometers from the Ridge and is an uphill climb through the beautiful deodar trees. It's a trek of approximately 2 kilometers from Ridge ground near Mall Road. The Jakhu temple of Simla is dedicated to the monkey God, Hanuman. The scenic view that surrounds this beautiful temple of India is absolutely breath taking and splendid.Here is a photograph of Jakhu temple !Jakhu temple has an interesting legend behind it. It is said that a deadly arrow injured Lord Rama's brother Lakshmana when he was fighting the battle with the demon king Ravana. A priest diagnosed Lakshmana and said that he needed a particular Sanjeevani herb from the Himalayas to cure Lakshmana. Hanuman was sent to get that herb from he lofty mountains. Upon reaching the Himalayas, Hanuman couldn't make out as to which herb was the Sanjeevani. So he dug up the entire mountain and flew back to where Lakshmana was lying injured.After Lakshmana was cured, Hanuman went back to place the mountain in its original site. He rested on top of the Jakhu hill for sometime. The Jakhu hill offers excellent views of sunrise, sunset, mountains and town.